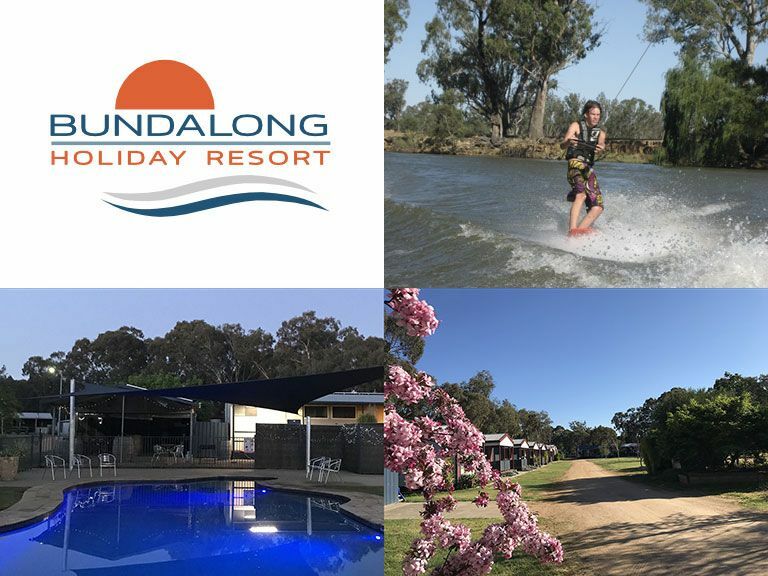 The Bundalong Holiday Resort is situated on the Murray Valley Highway within the tranquil village of Bundalong, just 10 minutes from the tourist centre of Yarrawonga and beautiful Lake Mulwala. Full of country charm, the Bundalong Holiday Resort is ideally located for guests interested in fishing, swimming, waking or skiing. Both the Murray and Ovens rivers are less than 1 kilometre of the Resort and there are walking tracks close by where you can see birds and native animals in their natural habitat. Within 10 kilometres you will find the start of the winery trails where some amazing wines await. The Resort also doubles as a great jumping off point for the towns of Rutherglen, Corowa and Wangaratta; all of which are within 35 Kms. Our Resort includes 2 bedroom deluxe cabins with open plan rooms as well as sites for Caravans, buses and tents. There is a lovely entertainment area with B.B.Q. facilities and a large Pool area. Get away from it all and read a book by the pool or explore the wonderful Murray area. It's all here at your finger tips. Just come back from 4 days here. Nice little park, neatly presented, clean amenities , nice pool area, couldn't ask for more really, kids weren't bored so happy days! We are return caravanners after having been here approximately 3 years ago and we absolutely love this caravan park. The owners are always available if you require anything. The park is very clean and we were lucky enough to have our own en-suites. Great place to take the family. Cabin had all that we needed for our stay. Close to the general store where we had great take away roast meal for tea on one of the nights we stayed. Pool was awesome and we enjoyed the entertainment area. What an enjoyable friendly place to stay Michael & Maree are so nice - we had our own on-suite which was a real surprise and was nice and clean - the pool was great and where they had us was super - we will be back.